Do you struggle to fit garments on yourself? 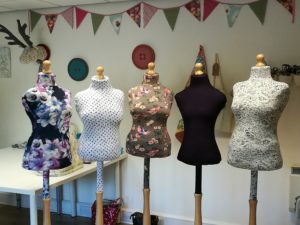 Do you have to adapt and adjust shop bought dressmakers mannequins to suit your shape? During this workshop you will create your own padded mannequin using your own body measurements. Having a personalised mannequin will enable you to fit and adapt your patterns and clothing with more precision. The mannequin will then be secured onto a suitable beech wood stand and you will make a gorgeous jersey cover in a pattern of your choice to coordinate with your home. Additional costs: You will need a tight fitting, long length (that sits on the hips), round necked T shirt and 1 metre of stretch jersey fabric in a pattern of your choice. Everything else is included in the price. Please note: You will need to wear a good fitting bra as this will determine the shape. This is a two day workshop running 10am - 4pm on Saturday 10th and Sunday 11th August 2019. Suitable for: Anyone who is interested in making personal garments.